Click on Select Options below to put yours together. You can earn 30 Brew Bucks on this product! 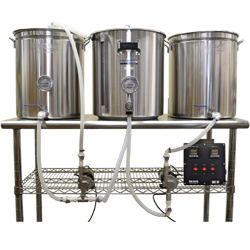 Choose 10 gallon vessels to brew 5 - 7 gal batches. 15 gallon vessels to brew 5 - 10 gallons of beer. 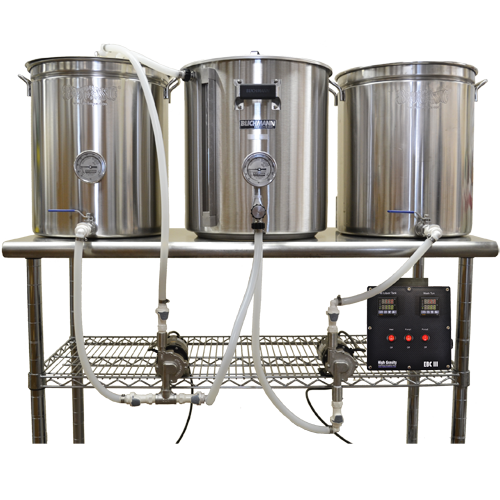 Build a high-performance one-barrel system with 55 gallon Boilermakers, two elements per vessel and the Wort Hog EBC-350. Click on Select Options below to put together a complete system, or just the pieces that you need. Looking at these tables we see that a single 5500W heating element can raise the temperature of a full 15 gallons an average of 200 degrees per hour. Starting with 55 degrees F, you can raise the temperature of the hot liquor tank to 170 in about 35 minutes. This is also typical of 30 gallons with two heating elements. The Blichmann TopTier Modular Brewing Stand will accommodate vessels up to 20 gallons for electric systems using shelves. Larger vessels will need to be placed on something else, and are usually located on the same level with two pumps. 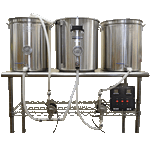 The Wort Hog EBC-130 is designed for a single vessel BIAB system, but can be used to operate a 3-V system. The probe can go in the mash tun, and the HLT temp would be dependent upon the mash temp, or vice versa. Kettle and HLT share the same heat outlet. The EBC-330 controls the HLT and mash temperatures independently of each other. This lets you operate in different ways. Kettle and HLT share the same heat outlet. The EBC-350 runs two heating elements independently and two pumps. We have the best guarantee in the business. We will take care of any problem with the controller as long as you own it. We will even cover the cost of returning it during the first year (contiguous US).